“Search for ‘abortion’ on YouTube last week and the top results were a horrifying mix of gore and dangerous misinformation,” Glaser wrote. “YouTube changed the results after I asked. If, until recently, you did the same over on Google-owned YouTube, it felt like you were searching in a whole other universe. 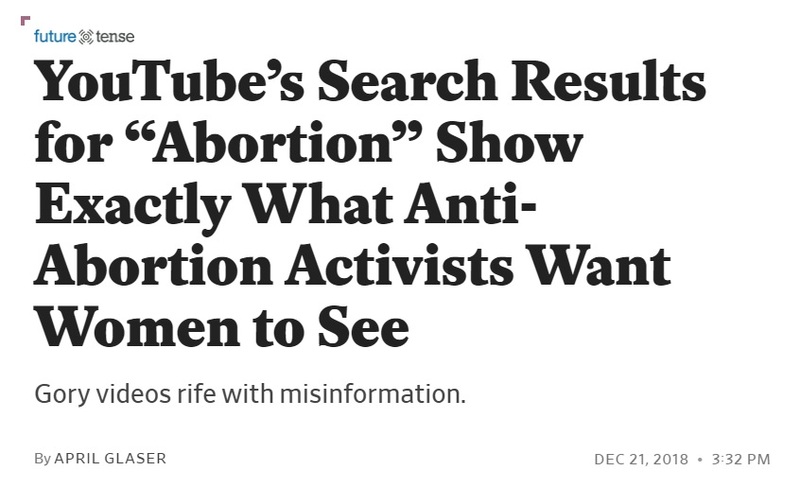 Before I raised the issue with YouTube late last week, the top search results for “abortion” on the site were almost all anti-abortion—and frequently misleading. One top result was a clip called “LIVE Abortion Video on Display,” which over the course of a gory two minutes shows images of a formed fetus’ tiny feet resting in a pool of blood. Several of the top results featured a doctor named Antony Levatino, including one in which he testified to the House Judiciary Committee that Planned Parenthood was aborting fetuses “the length of your hand plus several inches” in addition to several misleading animations that showed a fetus that looks like a sentient child in the uterus. The eighth result was a video from conservative pundit Ben Shapiro, just above a video of a woman self-narrating a blog titled, “Abortion: My Experience,” with text in the thumbnail that reads, “My Biggest Mistake.” Only two of the top 15 results struck me as not particularly political, and none of the top results focused on providing dispassionate, up-to-date medical information. It’s almost as if YouTube was showing people what they actually wanted to see rather than “dispassionate” videos no one gives a s**t about! I emailed YouTube Friday afternoon asking why anti-abortion videos saturated the search results for “abortion,” and if the platform thought accurate, health-focused information had a place there. By Monday morning, before the company got back to me, the search results had changed to include a number of news outlets among the top results, including a video from Vice about how women trying to get abortions are being stymied by anti-abortion centers that masquerade as clinics. The second video was a clip of former Arkansas Gov. Mike Huckabee describing his anti-abortion philosophy, and the third was a video titled “Speak Out: Abortion Is Not a Human Right.” By the end of this week, the top results (which are dynamic) included a news segment in Tamil, a video in which the director Penny Marshall (who died this week) “Opens Up on Drugs and Her Abortion,” and a clip of an anti-abortion advocate responding to the abortion-legalization law passed in Ireland. Anti-abortion content meant to enrage or provoke viewers was no longer purely dominating the results, though they still looked very different from the generally more sober Google results. When I searched “abortion” on Saturday morning I had to scroll down 39 pages to find the video titled “LIVE Abortion Video on Display” — which means you have to go past around 190 videos to get what was the number one result last week before Glaser complained. I’m sure it’s just a coincidence and Google’s engineers are not manually rigging anything!